Virtual Reality, Already a Reality (for the Payments Industry)? Note: This is the unedited version of an interview I gave to PCM, a payments industry trade journal produced by Payments & Cards Network. It is reprinted here with permission from the editor. In the interview I give a broad overview of the history of VR/AR and the unique challenges and opportunities presented by the medium to the payments industry today. The edited version of this interview can be found on their website, and a mirror can be found here. This piece was originally shared in my weekly newsletter. If you haven’t subscribed yet, you can do so here. PCM: There seems to be a lot of interest in virtual reality these days. How long has the technology been around, and why is there so much interest now? Me: First of all, I think that you’re definitely right about VR being a big trend right now. There are a lot of really interesting technical developments that helped to facilitate this current wave of VR interest, but it’s important to remember that VR is not a brand new idea. Take, for example, the head-mounted display which modifies the image that’s projected into your eyes based on where your head is in space. That technology has been around in some form or another since at least the early 1960s. Controllers that fit your hand like a glove have been around for a similarly long time, but a lot of these early experiments were confined to academic research and some corporate research and development labs. 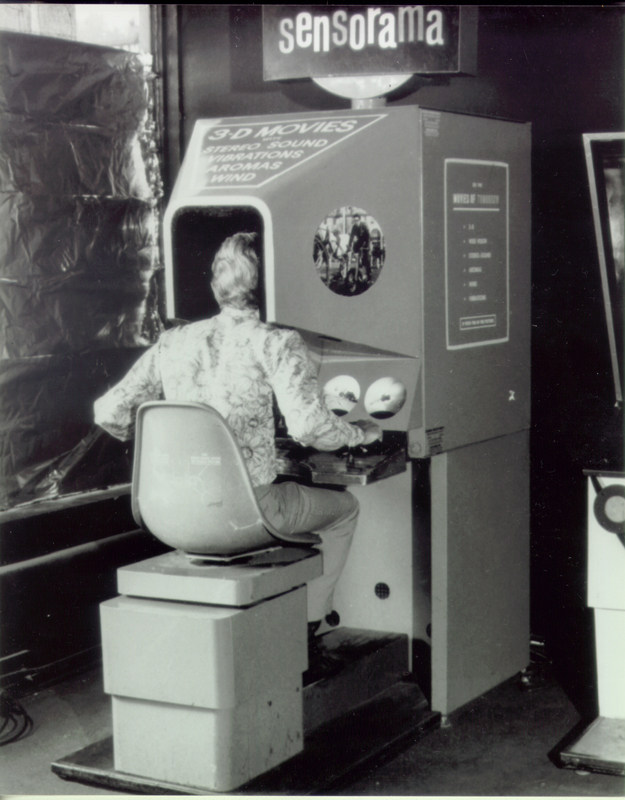 In the 1980s and 1990s there were several attempts made to commercialize VR technology, primarily by the video game industry, but it’s my understanding that those first attempts were fairly crude: lots of blocky, pixelated graphics and some significant lag in head tracking, which made users nauseous. All of this took away from the immersive experience that VR enthusiasts sought. The history of VR hardware is really interesting, but that’s kind of outside the scope of this conversation, so I’m sorry for digressing here. Today, though, both hardware and software have gotten to the point where that kind of immersive experience is achievable. The high end PC gaming industry really drove a lot of technical progress in graphics processing chips. Both computer and mobile phone producers have developed and adopted displays with extraordinarily fine resolution, so whatever is being displayed looks very smooth. And, we could probably thank the smartphone industry for the huge variety of inexpensive gyroscopes, sensors and other components that allow for head tracking, tilt detection and other features. All these components have been appropriated and remixed by the VR industry today. This is a long-winded way of saying that VR is the convergence of a lot of technical progress that’s come down to a price point that’s accessible to a lot of people now. PCM: How does VR make user experience better? Is there anything that’s bad or lacking in the VR experience? Me: So, obviously, one of the main ideas in VR is “immersion.” Regardless of where you are, truly great VR designers and content producers are trying to basically trick your brain into believing that it’s actually in the environment that’s being displayed to it through the headset and headphones. When done well, you really do feel like you’re in the experience, and that is really cool. There are things that can be improved on, at least in my experience. For one, most of the times I’ve experienced VR have been fairly passive and consumption-oriented. Like, watching videos in VR is fun. It’s neat that I can look around a room, or some outdoor setting, while the relevant action is happening in front of me. The times were I have been able to interact with my environment in a video game scenario were great too, but the immersive quality of those experiences were hampered by the fact that I was still using a video game controller. That’s not going to be the case going forward, because VR hardware makers are coming out with new controllers that allow for free use of one’s hands that are more fluid and natural than using a video game controller. So, for example, if I wanted to shoot a slingshot in VR I’d hold my left arm out straight, grab the “sling” with my right, pull back and release. I myself haven’t experienced that kind of immersion personally, yet, but I’ve heard reviews — specifically of the Oculus Touch controllers — and that’s the kind of experience that’s now possible. The last thing I’ll add as a limitation is probably something that VR hardware and software producers can’t control for. I get dizzy and motion sick very easily, both in real life and VR. So if you’re particularly sensitive to that sort of thing, it’s just something to be mindful of. PCM: What are the current trends in virtual reality? Me: It is important to remember that VR is a platform, just like smartphones and personal computers before them. Just like there is no one use for a smartphone or PC, there’s no one use for VR. So it’s kind of difficult to talk about “trends” in VR, because many different industries are using the technology in radically different ways. I know we’re going to be talking about VR as it relates to the shopping and payments space in a bit. So, very briefly, let’s review just some of the other applications of VR technology that I find most interesting. On the consumer side, the applications that are getting the most attention are on the entertainment side. It’s primarily focused on video gaming and immersive video of all varieties. Certain genres of video games and video content are better suited to the VR experience, and producers are acting accordingly. Personally, I’m fascinated with VR’s applications on the science, engineering and medical side. Industrial designers and engineers could use VR to design and model their creations in three dimensions in a way that’s more engaging than sitting at a desk working CAD software. In that area alone, VR has the potential to radically transform the earlier stages of the hardware product development cycle, which may increase the pace of innovation. Forgive the pun, but surgery is on the bleeding edge of VR application development. Just a couple of months ago, in April 2016, the first surgery was broadcast in 360º video, so you could imagine a point in the future when a surgeon could get a second opinion in real time from their colleague on the other side of the planet. And, there’s this one company that takes high-fidelity medical imaging and models it in VR, so a surgeon can get a feel for where a tumor is relative to important nerves or blood vessels before even making the first incision. There are possible applications in many other fields, ranging from education, historical preservation, military and police training, to business and finance. Like, what would a VR trading dashboard even look like? Visualizing a high frequency trading algorithm doing its work would be absolutely insane, and I really hope someone takes that idea and runs with it. PCM: The Fintech startup environment has been very dynamic for some time now. Who is especially interested in this sector and why? Me: So, first of all, I am an outsider to the traditional payments industry, but as a user and early adopter of emerging technologies in the space, I can totally agree that there’s been a lot of innovation in Fintech. There is of course a business incentive behind all of this innovation. At least for now, it costs something to transfer money electronically, and as long as that’s the case, any technology that makes interacting with that electronic system of value transfer easier to do more often for the end user will be pursued. Digital payment transaction volume generates the fees that allow the payments industry to run, so anything that can increase that transaction volume is worth pursuing from a business and investment standpoint. At least on the side of the Fintech industry I interact with most as a user, which is point of sale and online payments processing, there’s this push toward accessibility and ease of use, and startups are leading the way on a lot of this. A lot of these are names readers will probably recognize. Accessibility comes in a couple of different flavors here. For a lot of small businesses, the prospect of maintaining a dedicated credit card terminal is either unappealing or unaffordable, so a company like Square really changed the game. Square now has a lot of competition from companies that also let small business owners take credit card payments through their phone, but that was a huge boon to business owners. On the other hand, it’s my understanding that the technology side of the payments industry is difficult to access unless someone is already already an expert. So making a standardized platform with a suite of easy-to-use APIs makes the payments industry accessible to software developers who want to receive and process digital payments. If I have my history right, Paypal was the first company to do this at scale, but since then companies like Braintree and Stripe have made integrating payments into everything from mobile apps to marketplaces and traditional e-commerce stores a relatively easy thing to do. On the investment side, I recently took a look through some venture capital deal data and was at first surprised at the amount of money that large financial institutions, credit card companies and retailers are investing in innovative Fintech startups. There are also, of course, the usual VC investors from Silicon Valley and other innovation hubs. I know that Silicon Valley VC’s interest in financial technology has grown considerably over the past few years. But back to the corporate venture side, I’m now not so surprised because, again fitting with what I said at the beginning of this answer, their incentives are aligned with funding the companies that make transactions easier and more frequent. Assuming those startup companies come through, these corporate incumbents stand to benefit from increased transaction or sales volume. As far as internal VR projects go, I know there is some experimentation from Visa and MasterCard in the VR space, but there’s not a lot of information out there right now. PCM: There are a lot of great ideas and things that will make life simpler in the payments industry. Is Virtual Reality one of them? Me: Yes and no. The conservative answer to your question is that it’s very difficult to tell right now because this new wave of VR commercialization is still very much in its infancy. Remember that most mass-market VR headsets have only been available to developers for a little over a year now, and the consumer versions are just barely starting to ship, mostly to people who pre-ordered a long time ago. Right now, Oculus, the company Facebook bought, is facing some delays with its Rift units and HTC’s Vive headset has been sold out for months now. There are some headsets that allow you to use your smartphone as a screen, but, again, those have only been available for a short time and are limited by the platform they run on, namely smartphones. Suffice it to say there are still a lot of unknowns. But, in general, I would say there is a lot of extant and growing interest in VR on the commercial side of things. Although I’m not currently in the market for real estate, I’ve experienced this one demonstration of a VR application that allowed me to “walk” through a new condominium development that was still under construction. I was able to view the different countertop options, play around with paint colors, and switch out different styles of digital furniture to suit my preferences. The experience even featured a realistic rendering of the southward facing view out the main window, and allowed me to see how the light would fall in the room at different times of the day. Although this is more of an Augmented Reality (AR) application, rather than VR, some home goods retailers let you overlay a picture of a piece of furniture or fixture over an image of your room through your phone’s camera. One could imagine these demonstrations being used in all sorts of other scenarios besides real estate, car dealerships, and others. From your home or office, imagine shopping for a camping tent online and being able to sit “inside” it in a nice forest setting, complete with birds chirping and pine boughs rustling in the wind. To me, that is a much more engaging experience than looking at pictures online or even going to a camping store to shop for tents. So I think that VR definitely has a very compelling use case for improving a sales and shopping experience, but it’s difficult to say whether for these brief experiential encounters with VR will be a venue for the payments industry to take hold. I think a major influence on how this plays out is how people end up using VR. If it becomes the norm to go into VR for hours at a time, or there’s some kind of social interaction going on that might involve a transaction, then there is an opportunity there. But if people just dip in and out for mostly consumption-oriented experiences, like watching videos or movies, my bet is that any payment for those experiences would be mediated through one’s phone or computer. We’ll see how that plays out. PCM: How does that look from the customer’s perspective? What are the challenges VR present to the payments space? Me: In the payments industry it’s all a matter of reducing friction for the end user. Less friction equals a higher likelihood that the user will transact more regularly, because transaction is no longer a chore. In other words, technical progress has significantly lowered the hurdle between having the intent to transact, and completing the transaction. To me it seems like this is achieved by abstracting away the physical relics of the past, and this succession has been going on for a long time. There were a lot of steps between bartering for goods with crops and livestock to the physical coinage, paper money, checkbooks and credit cards we have today. Trading a chicken for a bag of grain involves lots of friction. Comparatively speaking, swiping a debit card for some frozen peas at the grocery store is much easier. But taking your physical credit card out every time you want to buy something online is kind of a pain, right? So, again, another layer of abstraction is in order. So that’s where something like PayPal, Amazon or a cached credit card in my web browser come in. I can just type in my username and password to authenticate myself, rather than go through the rigamarole of manually entering my credit card information. Then, with the press of my Enter key, I’ve paid and everything is on its way. But now, this is the challenge posed by VR. Assuming we’re in a situation where we are to make a transaction of real or imaginary currency in VR, what does that transaction experience look like? What’s the right approach to abstracting away the computer keyboard from the payments experience in VR? How will these transactions be performed securely? What kinds of risk are opened up to the platform operator and payment processor? What does the check-out process look like? Do designers seek to mimic real-world transactions where you check out at the virtual equivalent of a cash register? Do they appropriate design patterns for online stores from the flat-screened past? If the user is buying a physical good, where and how do they disclose shipping information? These are still open questions. The optimal user experience would not involve breaking immersion. We’re seeing some super early attempts at making that experience work, but again these are very early days. PCM: Can you predict a couple of paths toward building a seamless payment experience in VR based on current hardware trends and industry forecasts? Me: I think there are a couple of basic paths forward here. In all scenarios, there is a tremendous economic incentive for producers of VR hardware to develop their own centralized marketplaces for VR content, in the same way that Apple and Google benefit by taking a fee from publishers for their music, video and app marketplace services. Although the hardware manufacturers own the gateway to the customer’s experience of VR, namely the hardware or whatever VR platform is running on a desktop or smartphone, I’m inclined to believe that there will be a lot of cross-platform content and experiences, much like mobile apps with both iOS and Android versions. VR hardware and software makers like Facebook, Google, Samsung, Valve and Apple — if they release their own VR platform — all have this marketplace opportunity in front of them in the VR space. PCM: What does each scenario look like? Me: The first one is probably the least exciting to you and your readers. What if we just didn’t make payments in VR? This maintenance of the status quo certainly does not rule out the possibility that VR would be used in the sales process, but it might be the case that, in the future, VR content or goods the user previewed in VR are paid for the same way we pay for things today: by entering credit card details or through payment information stored on a user account. The next path is the more exciting one, and the one I researched and wrote about last year. In this scenario, we do start making payments in VR environments. I don’t think the innovation required to make this happen is going to come from third parties, because, again, owners of the VR hardware and software platforms have a huge incentive to develop proprietary payment methods. Just like with the rollout of ApplePay a couple of years ago, I think banks and credit card companies are going to have to strike deals individually with the different platform operators. I bring up ApplePay for a couple of reasons. It presents an interesting case study of a proprietary payments platform, yes, but it’s also a great example of how a hardware manufacturer used biometric data and simple, natural gestures to make the payments process smoother. Apple’s TouchID technology lets me bypass the interactional friction of keying in a passcode when I want to use my phone. In conjunction with the payment chip, TouchID makes the payment process easier. I avoid taking out my wallet, sliding my card into a chip reader, keying in my pin, and then putting everything away properly. And, I can leave my wallet at home, if I’m just stepping out to the corner store. So in real life, I can pay for things with my fingerprint and my phone. In a VR environment, I’m not going to blindly fumble around for my phone while I have a headset on, especially if it’s my phone powering the headset, like in the case of Samsung Gear VR. PCM: What is the solution here? Me: I contend that we’re literally staring at the solution. Irises and capillary patterns are as unique to everyone as fingerprints, so why can’t I use my payment information and user login information be digitally linked to my eyeball? I wouldn’t be surprised if in subsequent generations of VR headsets, manufacturers included some kind of iris tracking and scanner technology. When exactly that will happen, if it happens at all, I don’t know. There are some things that point in this direction, though. A company called FOVE is producing a VR headset with iris tracking, so it knows where you’re looking. In March of this year, FOVE closed an $11 million Series A round led by Colpl VR Fund, with participation from Chinese hardware manufacturing giant Foxconn and Samsung’s corporate venture capital fund. It’s a small and incremental step away from an iris scanner. And in June, 2016 Samsung filed a patent for an iris scanner that will likely be used in the Galaxy Note 7, the latest in the Galaxy class of phones that serve as Samsung Gear VR’s main hardware platform. That phone is rumored to be unveiled in August of this year, featuring what Samsung’s now trademarked “Galaxy Eyeprint” or “Galaxy Iris” security technology. So I suppose that, in many ways, the future of VR payments is already here. And, as an extra bonus, you might be able to use it in real life as well.